Are you looking for a old fashioned homemade lemonade recipe? When summer heat has you down, place some heavy mugs in the freezer and make a pitcher of this lemonade. When the mugs are chilled, pour yourself a glass. You can also use half lemonade and half iced tea for a wonderful change on an old fashioned drink (called an Arnold Palmer). You can rim the glass with sugar. To make the lemon syrup, combine lemon zest, sugar and 1/2 cup cold water in a small saucepan over very low heat. Bring to a simmer, stirring until sugar is dissolved; approximately 3 to 4 minutes. Remove from heat and let mixture cool completely before discarding the zest. The lemon syrup can be stored in an airtight container in the refrigerator for up to one month. 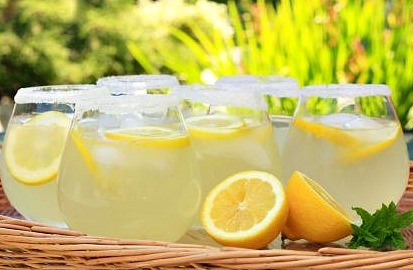 To serve, combine the syrup lemon juice and 4-1/2 cups of ice water in a large pitcher, and stir until well blended. Serve over crushed ice and garnish with lemon slices. **I only use 6 lemons with a hand-held lemon juice extractor. Usually you get 1/4 cup juice for each lemon (unless they are small). This is a tasty twist on the homemade lemonade recipe. It's very refreshing. Extract the juice from the apples - using a juicer. Combine all ingredients in a glass pitcher and stir until sugar is dissolved.